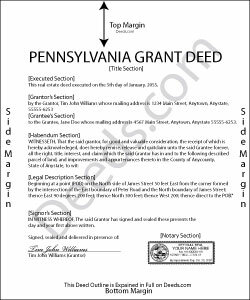 In Pennsylvania, title to real property can be transferred from one party to another by executing a grant deed, but the state does not include an official form in the statutes. Use a grant deed to transfer a fee simple interest with covenants that the title is free of any encumbrances (except for those stated in the deed) and that the grantor holds an interest in the property and is free to convey it. The word "grant" in the conveyancing clause typically signifies a grant deed. A lawful grant deed includes the grantor's full name, mailing address, and marital status; the consideration given for the transfer; and the grantee's full name, mailing address, marital status, and vesting. Vesting describes how the grantee holds title to the property. Generally, real property is owned in either sole ownership or in co-ownership. For Pennsylvania residential property, the primary methods for holding title are tenancy in common, joint tenancy, and tenancy by entirety. A conveyance of real estate to two or more persons creates a tenancy in common, unless otherwise stated (68 Pa.C.S. Section 110). A tenancy by entirety is available for spouses, and must be explicitly stated. In Pennsylvania, any property acquired by either spouse while married is presumed to be marital property "regardless of whether title is held individually or by the parties in some form of co-ownership" (23 Pa.C.S. Section 3501). Consult a lawyer for guidance on marital property implications. All deeds in Pennsylvania require a certificate of residence. This certificate ensures the accuracy of the information used for updating the billing address for property tax bills and assessment notices, and should contain addresses recognized by the USPS. Enter the full name and mailing addresses of both the grantee and the tax bill recipient. The certificate must be signed by the grantee or the grantee's agent. Any deed pertaining to an interest in real property for which a coal severance applies requires a notice pursuant to 52 Pa.C.S. 1551 (as part of the Conveyance Document Notice of Coal or Surface Support Severance Law). Any deed pertaining to an interest in real property situated in a Pennsylvania county in which bituminous coal has been found and separately assessed for taxation requires an additional notice signed by the grantee pursuant to 52 Pa.C.S. 1406.14 (as part of the Bituminous Mine Subsidence and Land Conservation Act). Note on the face of the deed whether the instrument requires either notice. Contact a lawyer to review the specific situation and ensure the deed contains all required notices. Pennsylvania levies a Realty Transfer Tax based on the consideration paid, which is due upon recording. If the transfer is exempt from the tax, state the reason for the exemption on the face of the deed. See 61 Pa.C.S. 91.193(6) for a list of exemptions. All deeds require a Statement of Value Form. Some counties require multiple copies. Contact the recorder for more information. Deeds falling under the jurisdiction of more than one municipality must stipulate the division of transfer taxes. This article is provided for informational purposes only and is not a substitute for the advice of an attorney. Contact a lawyer with questions about grant deeds, or for any other issues related to the transfer of real property in Pennsylvania.